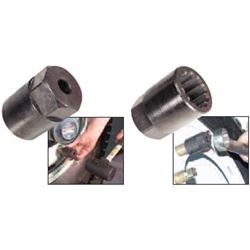 Dual Wheel Lug Stud Remover Fits 13/16" sq. inner nut Ken Tool 30165 / BOWES KT 30165. Special self-tapping splines provide maximum grip to remove stripped lug studs. Use with TR1, TR98 truck wrenches. Can also be used with an open end wrench. Use with soft faced hammer.